Celebrate Halloween with this vegan Spooky Not Too Sweet Halloween Spice Cake. Kids of all ages will love it! Some times we don’t have loads of time, or enthusiasm, to make complicated Halloween desserts or run to the craft store for props. That was me this year, although looking over my previous blog post it seems to be my M.O. to make easy, unfussy, yummy Halloween treats. These vegan Halloween treats, while easy really taste good and I think look good, too, for kids and adults alike. Before we get to today’s recipe for Spooky Not Too Sweet Halloween Spice Cake, I want to tell you about my time last week in The Triangle area of North Carolina. 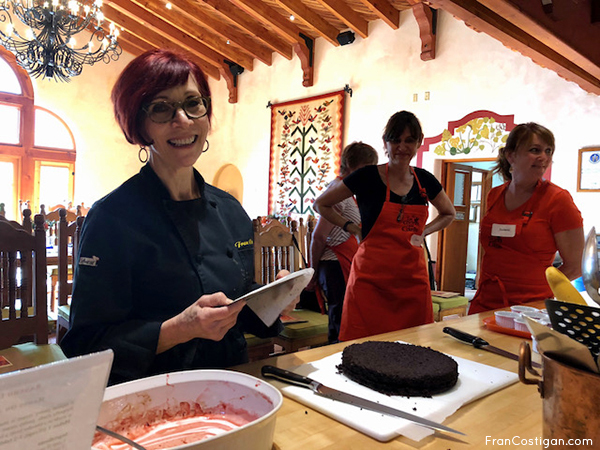 I was there to present a dessert for Veg-Forward Motion: The Power of Plant Based Eating Sustainable Classroom alongside co-presenters, chef Annie Pettry of Decca of New Orleans, and long time friend, cooking teacher Amanda Cushman. While waiting for my turn to demo the dessert course, I learned how to make vegetable dishes that will be on my table for sure. It was clear that it’s easy enough to veganize those that weren’t already. Our moderator, Breana Lai of Eating Well Magazine, informed us that Eating Well looks for a specific quantity of vegetables in every meal. 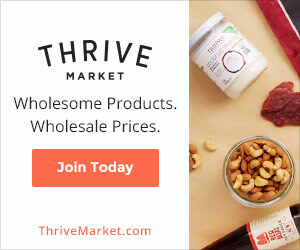 With vegan lunches and dinners, and between the classroom and my dessert class at Southern Season Cooking School and other Terra Vita events, I was a definitely time challenged catching up when I returned home. Halloween is almost here – what’s a busy person to do? I remembered the spontaneous and fabulous sorghum molasses tasting during lunch thanks to Susi Gott Seguret, author of the book I read cover to cover on the plane, Appalacia Appetite. Susi is the president of the North Carolina chapter of Les Dames D’Escoffier and a renowned fiddler, too. My favorite of the sorghums was one with the gooey top layer. 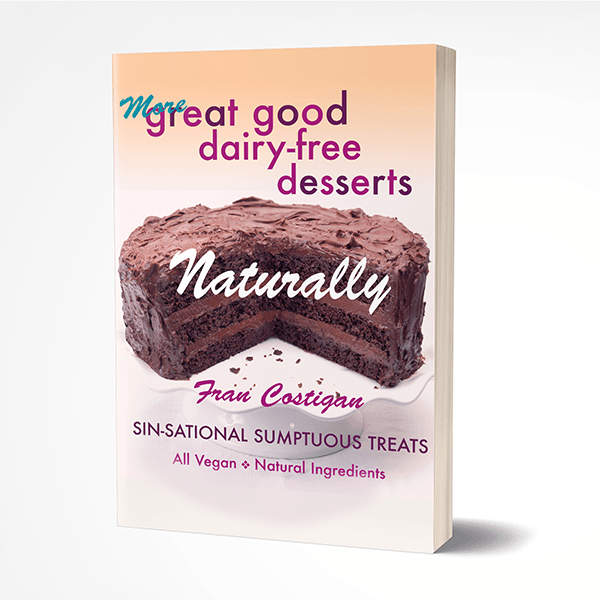 I first fell in love with sorghum molasses when I picked up a jar at my local New York City farmers market last year, and so with sorghum on my mind, I choose the Dark Moist Spice Cake from More Great Good Dairy Free Desserts Naturally as the base of a Halloween dessert. Instead of the molasses most of us Easterners know, the one made from sugarcane, I used sorghum, which is a cereal grass (gulten free). It has a milder taste than cane molasses, which is too strong tasting for some kids. Instead of the whole wheat pastry and AP flour in my original recipe, I used all light spelt flour. I had no dry mustard and decided against the clove, so they were out. The batter yield was 2 1/4 cups. (Learn to measure your batter for ease of moving to different pans.) After baking 12 cakes in a whoopee pie pan, I had 3/4 cup leftover, which was just enough to make 12 mini cupcakes. Yes, I tasted a cake! Wouldn’t you? The frosting had to be quick, easy, and not too sweet. I had ganache in the freezer, which I rewarmed over a water bath to spreadable. I had graham cracker crumbs in the freezer, too. To 1/4 cup of them I added contents of 2 charcoal tablets and some amount of chocolate sprinkles. This made a greenish, brownish dirt. You can substitute cocoa powder for charcoal if you prefer. To one 8-ounce container of vegan cream cheese, I added 1/3 cup organic confectioners sugar, sifted right over the bowl. I mixed this up with a hand beater and thought is was sweet enough. Spread some ganache over the disks of cake, and refrigerate to set. Add dollops of cream cheese to make eyes. No need to pipe it on, unless you want to. The cream cheese topping stayed creamy but firm for many hour at room temperature. Add chocolate chip eyeballs and white chocolate chips or slivered almond teeth. Set on plate of graham cracker crumb dirt, or cookie or cake crumb. Scatter some white chocolate or slivered almonds and serve. Note that I’ll be signing books Sunday at Jawn of the Dead with plenty of spooky treats to eat. Your kitchen will fill with a divine spicy scent, reminiscent of gingerbread, when you bake this cake. Position a rack in the middle of the oven and preheat to 350 degrees. Oil an 8 x 8-inch pan. Line the bottom with parchment paper cut to fit. Place a wire mesh strainer over a medium bowl. Add the pastry flour, white flour, baking powder, baking soda, ginger, cinnamon, salt, cloves, and dry mustard to the strainer. Tap the strainer against the palm of your hand to sift the ingredients into the bowl. Stir with a wire whisk to distribute the ingredients. Whisk the soymilk, oil, maple syrup, molasses, vanilla, and vinegar in a separate medium bowl until well blended. Pour into the dry mixture and stir with a whisk until the batter is smooth. Pour the batter into the prepared pan and smooth the top with a spatula. Bake for 20 to 25 minutes, until the cake is well risen and its sides are starting to pull away from the pan, and a cake tester inserted in the center comes out clean or with only a few moist crumbs. Cool the pan on a rack for 10 minutes. Run a thin knife between the cake and the inside of the pan. Invert onto a rack. Remove the pan and carefully peel off the parchment paper. Invert the layer again top- side up on a rack. Cool completely. Tip: The amount of batter in the pan is scant, but the cake rises considerably. If you’d like to make a layer cake, double the recipe and bake in two 9-inch round cake pans that are at least 2 inches deep. 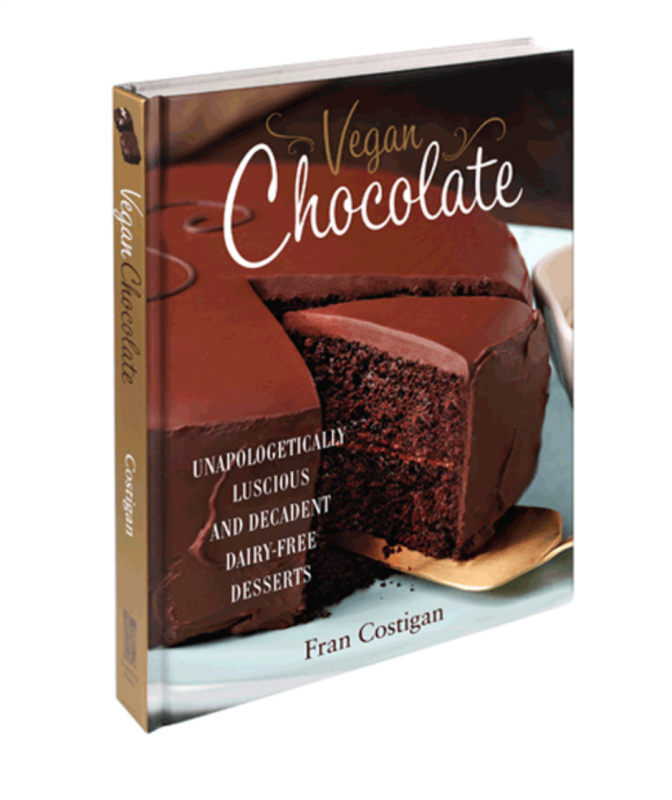 Recipe adapted from More Great Good Dairy Free Desserts Naturally © 2006 by Fran Costigan. Spooooky and cute. I love the health factor and the cute factor.